Welcome to the News Corner! It’s time to show you what we were working on during last month. Here comes better GI quality, Spot Light shadows, IES Profiles support, SSAO and much more. 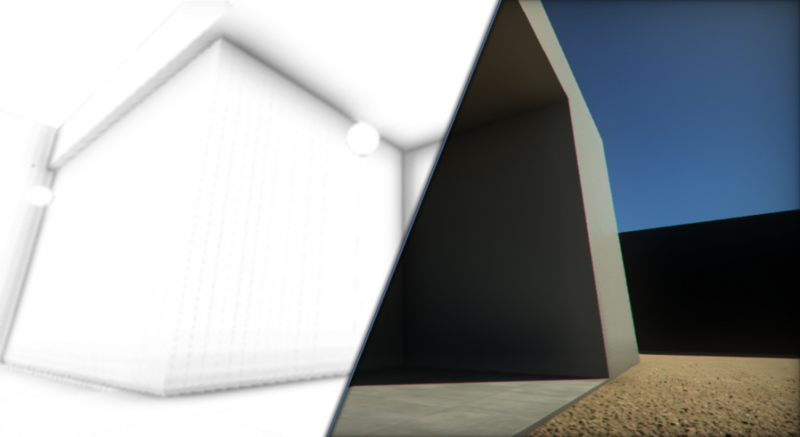 One of the most common screen space effects using in the current generation games are Ambient Occlusion and Local Reflections. Now we have them both! Technique we have implemented is called Adaptive Screen Space Ambient Occlusion. It provides significant performance improvement over most common SSAO implementations. Effect quality is quite nice and what is important ASSAO can easily adapt it’s quality for the desire performance. This means we have a whole set of Quality Levels for the effect. If you are interested here is open source Github repository with a code. Another exciting graphic feature is full IES Profiles support. It is common way to simulate real life appearance of light bulbs. 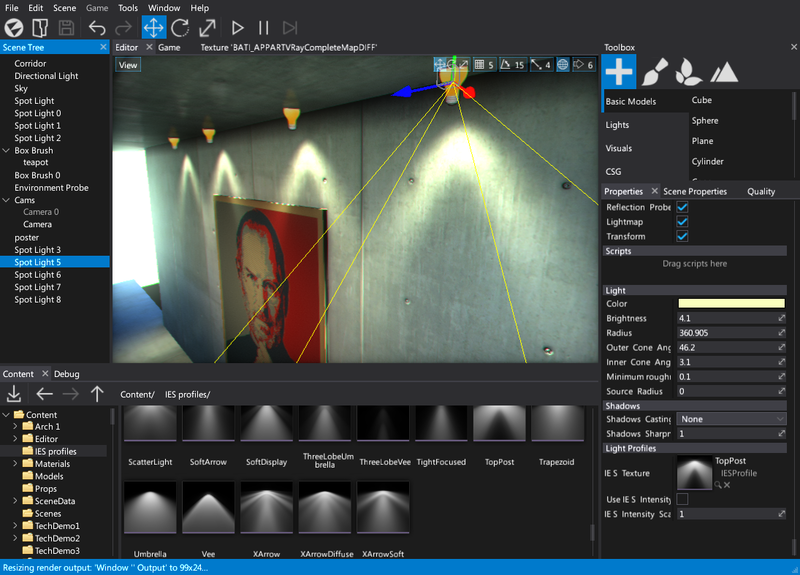 Engine can import .ies files and applies them on both Point and Spot lights. We have also set of parameters for the artists to play with. IES Profiles have even own section on features page: here. Recently, I’ve been using GI and static lightmapping feature a lot. It looks great and is very easy to use. But in order to achieve the best possible quality I’ve applied some more fixes and tweaks to the building process so now effect presents a little bit better. Previously, we’ve showed you Spot Lights (blog post) and now it’s time to reveal spot lights shadows. 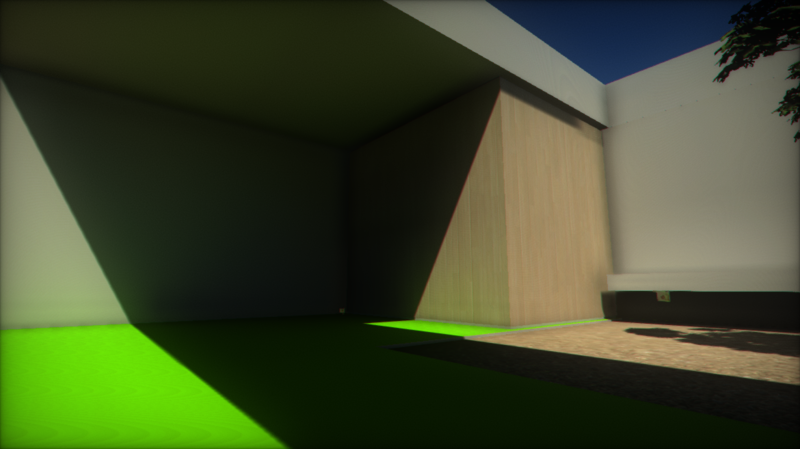 In-build solution to simulate spot/point/directional light shadows. Currently, we’re working on Engine Core parts. Doing some refactor and general code cleanup. Last few months were very busy and we’ve added a lot of new features. Now it’s time to slow down a little to review existing code and to prepare for big steps! Next breaking change will be moving Editor to C# and brand new Custom Editors feature.